Southeast Alaska, sometimes referred to as the Alaska Panhandle, is the southeastern portion of the U.S. state of Alaska, bordered to the east by the northern half of the Canadian province of British Columbia. The majority of Southeast Alaska's area is part of the Tongass National Forest, the United States' largest national forest. In many places, the international border runs along the crest of the Boundary Ranges of the Coast Mountains (see Alaska boundary dispute). The region is noted for its scenery and mild rainy climate. The largest cities in the region are Juneau, Sitka, and Ketchikan. Southeast Alaska is the northern terminus of the Inside Passage, a protected waterway of convoluted passages between islands and fjords, beginning in Puget Sound in Washington state. This was an important travel corridor for Tlingit and Haida Native peoples, as well as gold-rush era steamships. In modern times it is an important route for Alaska Marine Highway ferries as well as cruise ships. Southeast Alaska has a land area of 35,138 square miles (91,010 km2) comprising seven entire boroughs and two census areas, in addition to the portion of the Yakutat Borough lying east of 141° West longitude. Although it has only 6.14 percent of Alaska's land area, it is larger than the state of Maine, and almost as large as the state of Indiana. The Southeast Alaskan coast is roughly as long as the west coast of Canada. The 2010 census population of Southeast was 71,616 inhabitants, about 45 percent of whom were concentrated in the city of Juneau. It includes the Tongass National Forest (which manages Admiralty Island National Monument and Misty Fjords National Monument), Glacier Bay National Park, Sitka National Historical Park, Alaska's Inside Passage, and myriad large and small islands. The largest islands are, from North to South, Chichagof Island, Admiralty Island, Baranof Island, Kupreanof Island, Revillagigedo Island and Prince of Wales Island. 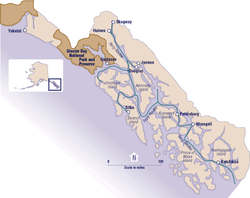 Major bodies of water of Southeast Alaska include Glacier Bay, Lynn Canal, Icy Strait, Chatham Strait, Stephens Passage, Frederick Sound, Sumner Strait, and Clarence Strait. On August 20, 1902, President Theodore Roosevelt established the Alexander Archipelago Forest Reserve, which formed the heart of the Tongass National Forest that covers most of the region. Southeast Alaska is a temperate rain forest within the Pacific temperate rain forest zone, as classified by the World Wildlife Fund's ecoregion system, which extends from northern California to Prince William Sound. The most common tree species are sitka spruce and western hemlock. Wildlife includes brown bears, black bears, the endemic Alexander Archipelago wolf, Sitka black-tailed deer, humpback whales, orcas, five species of salmon, bald eagles, harlequin ducks, scoters, and marbled murrelets. Major cities are Juneau, Ketchikan, and Sitka. Other towns are Petersburg, Wrangell, Metlakatla, Haines, Hoonah, Angoon, Kake, Craig, Klawock, Thorne Bay, Yakutat, Skagway, and Gustavus. There are also many towns and villages with around 100 people, such as Baranof Warm Springs, Edna Bay, Elfin Cove, Excursion Inlet, Funter Bay, Meyers Chuck, Pelican, Port Alexander, Port Frederick, Port Protection, and Tenakee Springs. This region is also home to the easternmost town in Alaska, Hyder. This area is the traditional homeland of the Tlingit, and home of a historic settling of Haida as well as a modern settlement of Tsimshian. The region is closely connected to Seattle and the American Pacific Northwest economically and culturally. Major industries in Southeast Alaska include commercial fishing and tourism (primarily the cruise ship industry). Logging has been an important industry in the past, but has been steadily declining with competition from other areas and the closure of the region's major pulp mills; the Alaska Forest Association described the situation as "desperate" in 2011. Its members include Alcan Forest Products (owned by Canadian Transpac Group, one of the top 5 log exporters in North America) and Viking Lumber, which had been founded in Maine. Debates over whether to expand logging in the federally owned Tongass are not uncommon. Mining remains important in the northern area with the Juneau mining district and Admiralty mining district hosting active mines as of 2015. Gold was discovered in 1880 and played an important part in the early history of the region. In the 2010s, mines increasingly begun to be explored and eventually completed in neighboring British Columbia, upstream of important rivers such as the Unuk and the Stikine, which became known as the transboundary mining issue. In 2014, the Mount Polley Mine disaster focused attention on the issue, and an agreement between Canada and Alaska was drafted in 2015. The proposed Kerr Sulphurets Mitchell exploration is upstream of the Unuk. Mines upstream of the Stikine include the Red Chris, which is owned by the same company (Imperial Metals) as the Mount Polley mine. The border between the Canadian province of British Columbia and Alaska was the subject of the Alaska boundary dispute, where the United States, Canada and the United Kingdom and British Columbia claimed different borderlines at the Alaskan Panhandle. While the British foreign affairs were in favor of support of the Canadian argument, the event resulted in what was thought of as a betrayal, leading to alienation of the British from the new nation of Canada. Due to the extremely rugged, mountainous nature of Southeastern Alaska, almost all communities (with the exception of Hyder, Skagway, and Haines) have no road connections outside of their locale, so aircraft and boats are the major means of transport. The Alaska Marine Highway passes through this region. Alaska Airlines is by far the largest air carrier in the region, with Juneau's Juneau International Airport serving as the aerial hub for all of Southeast and Ketchikan's Ketchikan International Airport serving as a secondary hub for southern Southeast Alaska. Alaska's bush airlines and air taxis serve many of the smaller and more isolated communities and villages in the regions. Many communities are accessible by air only by floatplane, as proper runways are often difficult to construct on the steep island slopes. Southeast Alaska is primarily served by the state-run Alaska Marine Highway, which links Skagway, Haines, Hoonah, Juneau, Sitka, Petersburg, Wrangell, Ketchikan and other outlying communities with Prince Rupert, BC and Bellingham, Washington; and secondarily by the Prince of Wales Island-based Inter-Island Ferry Authority, which provides the only scheduled passenger and auto ferry service to the island. A new Authority, the Rainforest Islands Ferry Authority, was created and in 2014 may possibly operate the North End route. The Authority would connect Coffman Cove with Wrangell and Petersburg. Small companies like Sitka-based Allen Marine and other independent operators in the Lynn Canal occasionally also offer marine passenger service. Ship traffic in the area is seasonally busy with cruise ships. ^ "AK Forest Association: SE timber situation 'desperate'". The Alaska Journal of Commerce. Archived from the original on 2016-04-19. Retrieved 2016-03-22. ^ "Our History - Trans-Pacific Energy Group". Trans-Pacific Energy Group. Archived from the original on 2016-03-17. Retrieved 2016-03-22. ^ "Viking Lumber - About Us, History". www.vikinglumber.com. Archived from the original on 2016-03-24. Retrieved 2016-03-22. ^ SitNews. "SitNews: Murkowski Questions Forest Service Spending, Timber Sales;". www.sitnews.us. Archived from the original on 2016-11-06. Retrieved 2016-03-22. ^ "In Alaska, a Battle to Keep Trees, or an Industry, Standing - NYTimes.com". mobile.nytimes.com. Archived from the original on 2016-11-06. Retrieved 2016-03-22. ^ Sisk, John. "The Southeastern Alaska Timber Industry: Historical Overview and Current Status" (PDF). Archived (PDF) from the original on 2016-11-06. ^ Schoenfeld, Ed; Juneau, CoastAlaska-. "Alaska drafts transboundary mine agreement with BC". Alaska Public Media. Archived from the original on 2015-11-19. Retrieved 2016-03-22. ^ "B.C. government approves permits for controversial Red Chris Mine". www.cbc.ca. Archived from the original on 2016-02-22. Retrieved 2016-03-22.